Please take your information STRAIGHT from ADMS, not second or third-hand. The information is being passed around incorrectly, which is causing stress and confusion. All of the information shown here is taken directly from your BRAYER magazine, of which you have a subscription as a member. 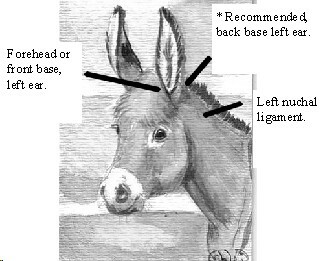 You must also be a member (and therefore get the BRAYER) in order to register your donkeys, this rule has not changed for more than 30 years. Donkeys will be required to have some form of PERMANENT ID (Microchip, tattoo, freeze brand, DNA on file) by this date. Microchips are strongly suggested. Freeze brands, such as angle brand used by the BLM, are a more visible alternative. ADMS wishes to remind breeders and owners that when the MDR was founded by Mrs. Langfeld in the 1950s, a Lip Tattoo or Brand was REQUIRED for registration of animals. This ruling was later phased out as people did not wish to Hot-brand their animals, and it was found that lip tattoos faded and became illegible over time. The Registry realizes that not every person, breeders, vet, nor sale barn has a microchip reader. This is one reason that microchips are not being specified as the only form of acceptable ID. However, the cost of readers has decreased substantially over the past ten years. Normal locations for microchips are: Left nuchal ligament. Back base left ear. Front base left ear. Back base right ear. Right luchal ligament. The first three listed are the preferred areas, as they are the most commonly used. Multi-chip readers can be found on the internet, and your vet may also be able to receive one at a discounted price. Your club members might also consider doing a fundraiser so that the local club can have a reader. Many shows and sales are also performing microchipping demos, and will have a reader on-hand. Below is a list of some readers/scanners we found simply by doing a Google search. ADMS is not endorsing any of these products, they are listed only to make your search easier. Light Livestock Equipment - IMAX portable reader - $299. Agri-med.com - Home again chips for $12.95, bulk pricing available. Atozvetsupply.com - Universal readers, $260.00. Bulk Home Again chips - $900/100 chips, or $9 each. Most commonly used chips... Destron, AVID. Microchips of various brands can be found as low as $9 each when purchased in bulk. Again, consider going in with friends or club members to get a group/bulk discount. UPDATE: As per discussion with Pres. Paul Hutchins, Pet Geldings will be exempt from Permanent ID. HOWEVER, it is recommended that any gelding going to Shows, trail rides, parades, nursing home visits, etc -have a form of PERM ID. Also note we have added a page for Law Enforcement/Shelters/Rescues regarding Lost and Found animals that scan with a microchip or have another form of Permanent ID.